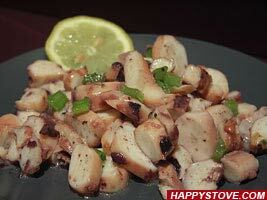 Octopus Salad is a delectable recipe for a healthy and low calories meal. This simple and delicious seafood dish can be served as a light entrée or elaborate appetizer. Prepare the octopus as described in How to Cook an Octopus ↪. Cut the octopus tentacles in small pieces and the head in strips. Dress with chopped celery, the lemon juice, the extra virgin olive oil and the Italian parsley. Adjust with salt and pepper. Let marinade for at least one hour at room temperature. Octopus, when at fridge temperature, loses parts of its flavor. Always bring to room temperature, before serving. If you like, you can remove the sucker disks form the tentacles before cutting the octopus in pieces. Spaghetti allo Scoglio (Fresh Seafood Pasta) recipe is a traditional Italian seafood dish, usually one of the most expensive in any restaurant. You may cook your own at home with surprising results as described step by step in this recipe.